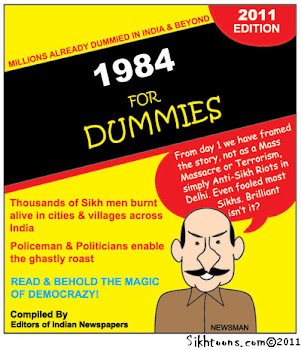 THE ROAD TO KHALISTAN: PETITION: Golf Digest Depicts Fifth Sikh Guru as "Golf Guru"
PETITION: Golf Digest Depicts Fifth Sikh Guru as "Golf Guru"
Golf Digest Depicts Fifth Sikh Guru as "Golf Guru"
Washington D.C. – May 29, 2008: The Sikh American Legal Defense and Education Fund (SALDEF), the nation’s oldest Sikh American civil rights and advocacy organization, calls upon Golf Digest to apologize for the depiction of Sikhism’s Fifth Guru, Guru Arjan Dev Ji, as a “Golfing Guru" in its May 2008 edition. 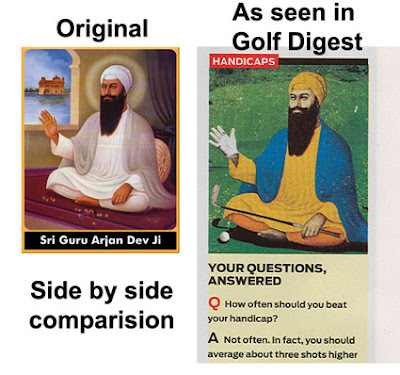 However, under closer examination, the image Golf Digest uses appears to in fact be a widely distributed picture of Guru Arjan Dev Ji, Sikhism’s fifth Guru. Guru Arjan Dev Ji was instrumental in strengthening the message of equality and freedom of the Sikh faith. He stood up against all types of religious oppression and denounced social segregation. SALDEF urges the community to sign the petition to voice your displeasure in the use of the image in their publication. 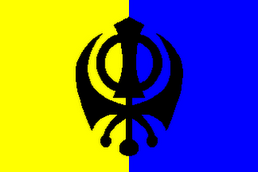 SALDEF would like to thank Sartaj Singh Dhami and Harjit Singh Sandhar for bringing this depiction to our attention and for allowing us to use the photo above which was taken from Mr. Dhami's blog, Restoring the Pride. We as a community love to make such things an issue because these are the things we feel will keep us in lime light.There is so much more that can actually help us be on the right track.Our Gurus were much ahead of their times and it is our good fortune that we belong to religion based totally on logic and intelligence.But we defeat the complete purpose by running after controversies which can make no difference to our great religion(it is neither weak nor shaky).We have to rise above the mundane.More important would be to educate our priests.We have handed over our religion to uneducated priests who can cram our scriptures and rattle them out without understanding the essence.We need special collages and universities for theology where there is in-depth study of our scriptures and there is room for the new generations to participate.The Gurus were all well turned out ,smart and charismatic and nowhere did they want us to be one sloppy lot.Then why do we not pull up our socks and move, if not ahead,then perhaps with the times. Every time I go to Punjab my heart cries for the punjabi youth.They lag behind for even education and job opportunities in comparison to rest of India.We are led by opportunists who will not plan for the future of the state because they are not capable of visualizing a future for the state or community.It all boils down to having educated leaders both on religious and political fronts.Lets get out of small squabbles which make no difference to our great religion and look at ways to make ourselves worthy of our religion.Remember the picture of Guruji was being associated with winning and nothing derogatory was indicated.Interpretations will be numerous left to people who have nothing better.Our gurus in those days started our religion and propagated it to such an extent that their followers are in such great numbers not only in sikh but other communities as well.What are we doing to make sure that others love and respect us and hold our religion in awe?I somehow feel our gurus wanted that,but we would rather concentrate on rituals and every thing that we were told not to do and make our presence felt in a negative way.Its time we woke up.